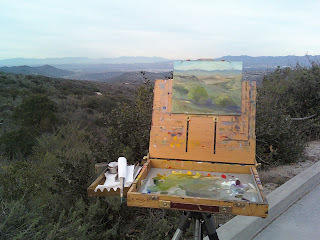 Today, for our last paintings in 2009, we're sketching and studying this terrain, that poses some interesting challenges. What we are looking at, is a view from a bluff, looking across a brushy slope in the foreground, to three distinctly different mountain ranges (different elevations). In the middle ground, the terrain drops down into the flat area of the town. I am trying to imagine what that must have looked like, before it was developed into homes, business districts, etc. Probably looked more like a flood plain, with cattle grazing. Now, one would never know it's humble beginnings. While painting this last one of 2009, I am looking around and noticing that it is a perfect setting to "kick off" the new year, and reminds me that when things seem to be a bit overwhelming, I need to scramble up to a better vantage point, and take a look at the big picture! I am looking forward to seeing all of you, as we turn the page, and begin the new year. A special Happy New Year wish, goes out to Virginia Vaughan, for her new project "Passing America". Most of you know of my fondness for painting California's rural farm lands and ranches, and Virginia's work promises to be a very important body of work that render those images of the old west, into canvas and paint.